“In the late 1940s after demob I lived with my sister in Tisbury Road, Hove. The house was directly opposite that wonderful red brick building the ‘real’ Hove Town Hall. I loved its majestic clock tower with its tuneful chimes. It woke me many times after a night on the tiles, even then I loved every minute of it. “Then disaster struck and fire raged through the building. I was in Surrey Fire Brigade and heard the East Sussex stations close to us ‘covering up’, so we knew it must be a big one. “I saw what was left afterwards but thought the walls looked good enough for repairs to be carried out. Sadly the experts didn’t agree with me and the building was demolished. The morning after the fire, now nearly 40 years ago, I went down to Church Road to observe the damping-down of the smoking remains. While I had only been inside the Town Hall once (as part of a PE display by my school), it felt like losing an old friend. The ornate red building seemed unreal with smoke pouring out and no roof. I took some photos and went home, feeling quite depressed. My grandparents lived at 18 Norton Road when the Town Hall was burnt down. Their house was knocked down to make way for the new Town Hall. My gandmother felt the fire in the old Town Hall was a conspiricy to get rid of the old building; with stories of waste paper bins catching fire and the caretaker committing suiside a year later. The original rebuilding plan was to take the whole block all the way to the far end of Norton Road, but the residents campaigned to stop this so only a handful of houses where removed in the enlargement and rebuild. I never knew the old building although I visited the new one many times and have happy memories of events there. I thought all town halls were concrete like the Hove one as a child and was suprised by other places with amazing Victorian seats of government. (Eastbourne is a real treat.) A last note, in Norton Road the old garden wall next to the new Town Hall is painted pink, which my grandmother painted when she lived there. Dave Huggins – Were you an instructor at Reigate Training Centre in 1971? I lived in Tisbury Road as a very small child in the 1940s. I remember the beautiful chiming clock. One tune was ‘Men of Harlech’. Does anyone remember any of the other tunes? It always played at 1pm – the time when my Gran always served lunch – and all the shops shut for lunch. I used to go regulary to the pre-fire Town Hall with my grandmother to pay the rent on her house in Linton Road (no.36). It was an impressive building. I particularly remember the brass handrails inside. Colin – yes, I was at Reigate training school – sorry for the delay I had not seen your query! Regarding the comment made about the conspiracy theory behind the Hove Town Hall fire: being the granddaughter of the caretaker, I’m quite offended that there are such rumours that my grandfather would have jeopardised the lives of my grandmother, dad, uncle and auntie. I think ‘people’ should be a little more thoughtful with their so called theories! My dad was left fatherless and my granny husbandless, and such rumours are actually quite damaging. The fire was in 1966, 40 years ago next year. It was the last major fire that my Dad, as a fireman based at Hove Fire Station, took part in. It was the fire that made him decide that he’d had enough when he was deemed too old, at the age of 44, to use breathing equipment. I can remember the worry that my Mum went through that night, I was 15 at the time. My Dad is still around and still living in Brighton. He is 84 in January. I regard the current Hove Town Hall as one of Brighton and Hove’s finest pieces of architecture. Its use of then modern materials and techniques puts it at the forefront of ‘brutalist’ buildings in the UK. Hove Fire Station in English Close is 30 years old this year and, to celebrate, a reunion event is being held to mark the 30th year. If you served at either Hove Street or Engligh Close please get in touch. Am in need of photos of the early days at English Close, along with the dark days of the first strike, for a display on the night. I remember the fire and the night it happened there had been a function – the caterer being a good friend of my father’s. It was believed to have been caused by cigarettes not being extinguished properly. I was born in Hove in 1964, so I don’t remember the old Town Hall, but having been in the new one many times, I think it’s a monstrosity. Having worked at Hove Fire Station for a number of years, several photo’s and even an old cine film have come to light about the Great Fire at Hove Town hall (1966), these will shortly be on display at the Fire Station. Several other photos from this are still missing. If you have any please let me know if you are willing to allow them to be copied. Editor’s note: The My Brighton And Hove web site do not hold any materials relating to this subject. Perhaps Darren would consider submitting a page about the fire. How can I go about constructing a page for you and what information would you like? Would you consider a link/ page to the East Sussex Fire and Rescue site? Editors note: For details on how to submit a page and for content guidelines, please click here. I vividly remember the night of the fire. We lived over a shop almost opposite the Town Hall and my mother woke us in the early hours of the morning. We watched for hours and made tea for the firemen whose fire engines were parked outside our shop. It was a very sad end of a beautiful building and I will never forget it. I found a beautiful old book. ‘Poems of Tennyson’. Inside was an inscription to May Cook, of East Hove Girls school. Please if anyone knows her or living relatives please contact me. I would love to know more about this wonderful woman and what she may have gone on to do with her life. Helen Burtenshaw, I believe I was at Goldstone School in Ellen Street with your mother, Anne. We were in the same class – 2A with Mr Lovett, 3A with Miss Lewis and 4A with Mr Wallace. 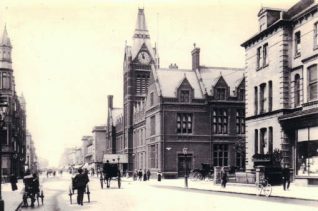 My father was in the Borough Treasurer’s Department in the Town Hall Annexe, across the road from the Town Hall. I remember going down there early on the Sunday morning when the fire was still smouldering. Such a beautiful old building. Interested to read about the fire at the Town Hall after coming back from Brighton museums where I saw a display on the incident. At the time of the fire my grandad, Mr William Alexander, was Chief Clerk at the Housing department in the building and I wonder if anyone who knows about the building can tell me any more about him? I am currently writing our family history and would be grateful for any stories that I could include. I was there with many others and watched it from the beginning. Like pictures of London in the Blitz. Hoses and ladders across Church Road, the building on fire starting in Tisbury Road then all the windows in brilliant orange, the old fire engine from somewhere in Brighton turning up with the bell ringing, the heat from the collapsing main ball room area throwing the bricks into the grounds in Tisbury, the caretaker being brought down a ladder into Church Road. People turned out from Tisbury standing in their dressing gowns watching from a distance waiting for the clock tower to collapse. I didnt have a camera. It was a night to remember though. Born in Brighton,1952. My parents were Spanish immigrants and we lived at 3 Florence Ave in Hove. I remember at the age of 7 or 8 going with my dad to help him with his cleaning duties. I´m not sure whether he was caretaker or cleaner, but I loved going. He showed me all the building, even taking me up into the clock tower. When the wrestling events were on he would take me…he loved Jackie Palo and Johnny Quango. He was asked to be corner man many times, and said he had to wrestle once because someone didn’t turn up. I´m not sure if that´s true but at home he would teach me all the moves…constantly grappling each other. It would drive my mum mad. I have lived in Spain with my wife, also from Brighton, since 93 and have got to know all my Spanish roots. My father was called Santiago Cervantes, my mum Angustias Cervantes. My brother was a policeman stationed at Hove. At the time of the Town Hall fire he was on night duty and I believe that having realised the Town Hall was on fire ran back to his car and got his cine camera. I don’t know whether he still has the film of the Town Hall burning, but I remember watching the film later. I have vague memories of the place and even as a very small child found it overwhelming in its size. When I was at primary school in the early 1960s we used to have an annual “music making” at Hove Town Hall and all the schools in Hove joined in. At the same time my mother worked for the Inland Revenue and they had a Christmas party every year in the Town Hall. What I remember most is the cavernous (to a child) hall where these events took place and the smell of wood. We lived at 3 Norton Road until 1938. It is no longer there, but I remember running to Parris & Greenings Chemist on the corner for my mother. I knew the old town hall very well, there was a police station next to it in Norton Road with a wide pavement outside where I used to practise my roller-skating. The skates cost a shilling each skate, 2/- for the pair at Woolworths. Someone asked the names of other tunes played on the hours – I recall one that went, “Where, tell me where, has my true lover gone? He’s gone to bonnie Scotland where grows the sweet bluebell…” Can’t remember the name though, and probably the words are wrong, but it was 75 years ago! My parents used to run a B&B at 62 Tisbury Road at the time of the fire. In my memories it would have been earlier than 1966 by 1 or 2 years, but just goes to show how wrong these can be. My grandparents ran the B&B before my parents. Both of my sisters and I went to St Andrews Infant School and I have fantastic memories of this wonderful school. I don’t remember many of the other pupils’ names, but seem to remember a Stephen (Matingly?) who lived just off Blatchington Road. The green grocer delivered to us by horse and cart – yes it was 1966 not 1866, I think I recall him as George. I have fond memories of the old Hove Town Hall. I held my 21st Birthday party there just a couple of years before the fire. I was saddened to see it’s demise. I was married in September 1965 and had the reception at Hove Town Hall. I thought it burned down shortly after then.